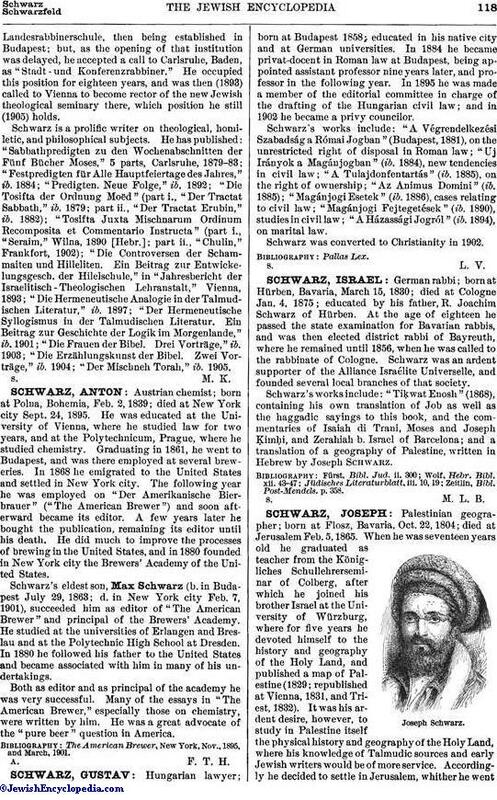 German rabbi; born at Hürben, Bavaria, March 15, 1830; died at Cologne Jan. 4, 1875; educated by his father, R. Joachim Schwarz of Hürben. At the age of eighteen he passed the state examination for Bavarian rabbis, and was then elected district rabbi of Bayreuth, where he remained until 1856, when he was called to the rabbinate of Cologne. Schwarz was an ardent supporter of the Alliance Israélite Universelle, and founded several local branches of that society. Schwarz's works include: "Tiḳwat Enosh" (1868), containing his own translation of Job as well as the haggadic sayings to this book, and the commentaries of Isaiah di Trani, Moses and Joseph Ḳimḥi, and Zerahiah b. Israel of Barcelona; and a translation of a geography of Palestine, written in Hebrew by Joseph Schwarz. Zeitlin, Bibl. Post-Mendels. p. 358.